Studying an undergraduate degree in Sport and Exercise Sciences at the University of Leeds will give you core life science disciplines and will teach you how the body and mind respond to and learn from the demands placed on them in sport and exercise. This course gives you the perfect opportunity to explore the biological process of the body during physical activity, sport and exercise. You’ll study four core disciplines: exercise physiology, biomechanics, motor control, and sport and exercise psychology – inviting you to ask questions such as: How do common sports injuries occur? How does the cardiorespiratory system react in an extreme environment? What motivates people to take part in sport? Our integrated Masters offers you an additional year of specialist training. You’ll undertake an extended research project and study advanced research topics. Sport and Exercise Science provides an understanding of how the body and mind cope with, handle and learn from the stresses of performance in sport and exercise. Number 1 in the UK for ‘world-leading’ research in the area of sport and exercise sciences (REF, 2014). Ranked 3rd in the UK for sports science (The Times/Sunday Times Good University Guide 2018; The Guardian University Guide 2018). A wide range of research-led optional modules includes Neuroscience for Exercise Science, Exercise and Psychological Health, Cellular Cardiology and Systems Neurophysiology. 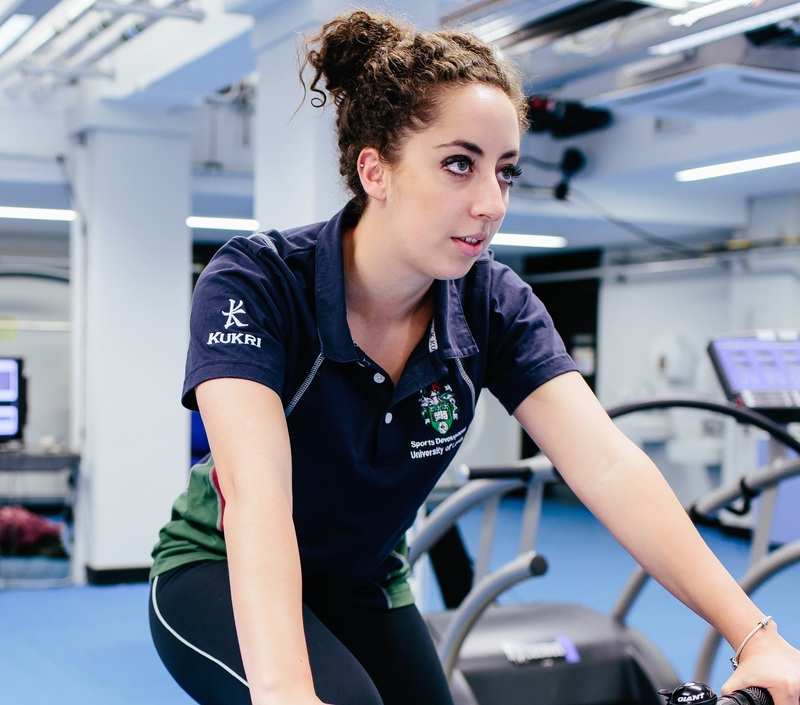 Year 1 is a common course year, which will introduce you to the core concepts of sports science, including biomechanics, exercise physiology, motor control and sport and exercise psychology. This is supported by additional professional and academic skills modules, where there are opportunities to take coaching awards or short work placements. In Year 2 you’ll build on the knowledge and skills from year one, taking specialist modules in areas such as the mechanics of sport and exercise science, while further developing your practical skills in our state-of-the art laboratories. You’ll graduate with the skills and attributes sought by employers in numerous areas. In Year 3 of the MSci, you will take compulsory and optional modules from the BSc alongside preparing for Masters-level study. In Year 4 your main focus will be on an extended research project in your area of interest. Recent topics include ‘Influence of footwear on knee joint kinetics’ and ‘Biomechanical characteristics of the delivery steps in cricket fast bowling’. As an MSci graduate, you’ll leave with the advanced-level skills and knowledge that should set you apart in the graduate job market. Indirect muscle stimulation – a complementary therapeutic intervention? Eccentric exercise – effective intervention for exercise intolerance? Including a science subject OR both Psychology and Sports Science/PE in place of a science at A2. Critical Thinking and General Studies excluded. GCSE: GCSE: Grade B or above at GCSE Maths and Grade C or above at GCSE English. Pass 60 credits overall with 45 credits at Level 3, graded at D45M0P0 to D30M15P0 including distinctions in Biology and Mathematics or Chemistry. Applicants with BTEC Diploma or Extended Diploma qualifications must have at least one science or psychology at A2-level A-level. Applicants with BTEC Subsidiary Diploma qualifications must have at least 2 A2 A-Levels and at least one of these should be in a science subject. Preferred BTEC qualification subjects include Applied Science or Sport and Exercise Science. Offers would be in the range A/B in the A2-level subjects and Distinctions in the BTEC qualification. D3/D3/D3-D3/M1/M1 including D3 in Biology plus another science or science-related subject. D3/D3/D3 including Pre-U Biology plus another science or science-related subject. 35-33 points (18-17 at Higher Level) including 6 in a science OR a 6 in Psychology and a 6 in Sports Science/PE. 35 points (18 at Higher Level) including 6 in a science OR a 6 in Psychology and a 6 in Sports Science/PE. H2,H2,H2,H2,H2,H2 - H2,H2,H2,H3,H3,H3 including H2 science (Biology, Mathematics, Physics or Chemistry) and another science or science-related subject at Higher Level. H2,H2,H2,H2,H2,H2 including H2 science (Biology, Mathematics, Physics or Chemistry) and another science or science-related subject at Higher Level. Advanced Higher: 5 x Highers AABBB-ABBBB, with AA-AB in 2 Advanced Highers including a science subject OR both Psychology and Sports Science/PE. General Studies and Critical Thinking excluded. We accept the following science subjects: biology, human biology, chemistry, mathematics, physics. Advanced Higher: 5 x Highers AABBB, with AA in 2 Advanced Highers including a science subject OR both Psychology and Sports Science/PE. General Studies and Critical Thinking excluded. We accept the following science subjects: biology, human biology, chemistry, mathematics, physics. AAA-ABB including a science subject OR both Psychology and Sports Science/PE in place of a science. General Studies, Critical Thinking and Advanced Skills excluded. AAA including a science subject OR both Psychology and Sports Science/PE in place of a science. Critical Thinking and General Studies excluded. We accept the following science subjects: Biology, Human Biology, Chemistry, Maths and Physics.Science- related subjects: PE, Geography, Use of Maths, Psychology, Statistics, Geology and Computing. You’ll develop excellent communication and interpersonal skills by undertaking additional experiences outside the academic requirements of the course, which could include taking a national coaching award. We have a very close relationship with CP+R (Clinical Prevention and Rehabilitation) – they visit us several times a year, speaking at careers seminars, attending careers fairs and running drop-in sessions. They also organise for our students to visit their workplace, to gain a better understanding of their work. They are very interested in our students and usually recruit 1-2 of our graduates every year. Sport and Exercise Sciences graduates have gone on to roles in education and training, biomechanics, coaching, clinical support, physiotherapy, teaching, physiology, occupational health, and providing technical expertise for major sports organisations. Strength and conditioning coach, Civil Service. We offer a host of additional opportunities beyond core course content, including volunteering and placements. These include our annual Faculty Graduate Panel, where graduates are invited back to talk about their work and network with our students, and our Sport and Exercise Sciences Careers and STEM Careers fairs, which give you the chance to meet employers, speak to alumni, attend workshops and get masses of information.